Some time ago I got approached by a corporate customer who was looking for a solution to have his vehicles report their location to his server. Previously he had been using Nokia phones and now he was looking to switch to iPhones. So I built a quick app for him, but due to lack of multitasking in iOS 3 it had limited use. 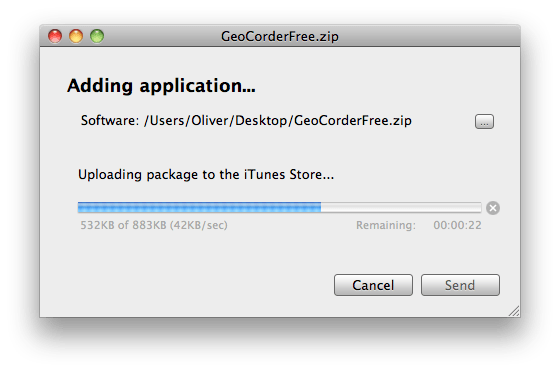 But then Apple surprised us with backgrounding for location apps and suddenly make apps like GeoCorder all the more useful. 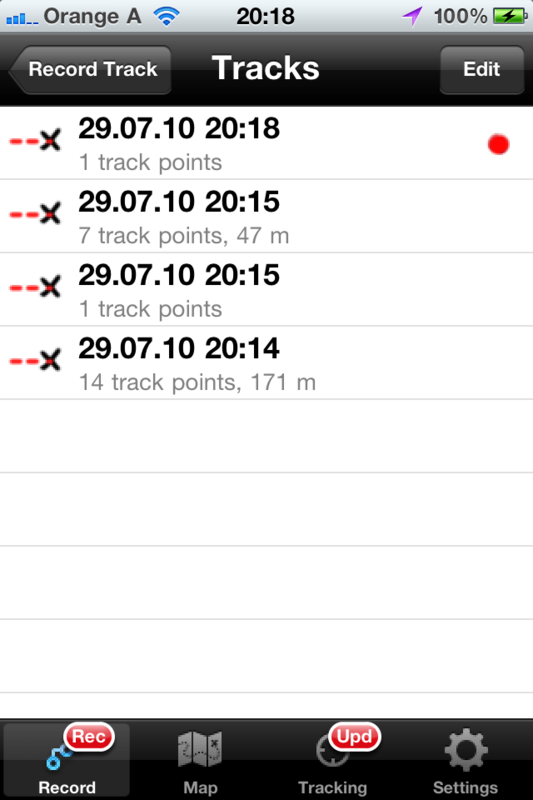 But I did not think that this mini tracking app by itself would make a good addition to the app store, so I insisted of merging this functionality into GeoCorder. So now GeoCorder can record GPX tracks for photo tagging or viewing in Google Earth and can also ping your server with a customizable HTTP GET. 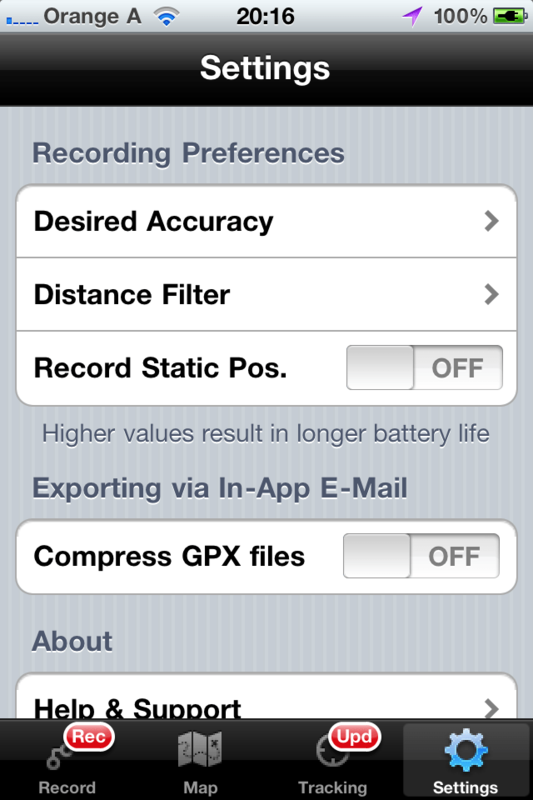 For the UI you might notice that I moved the recording controls into the navigation bar. Also this is now using a tab bar controller to switch between multiple views with differing functionality. I switched the tracks view and the recording view because for a recording app the recording screen obviously is the more important view. Once I started to think about the functionality of this app I suddenly had my head fill will lots of additional things, most of which did not make the cut for what is supposed to be a minor upgrade that turned into a 4 day project. 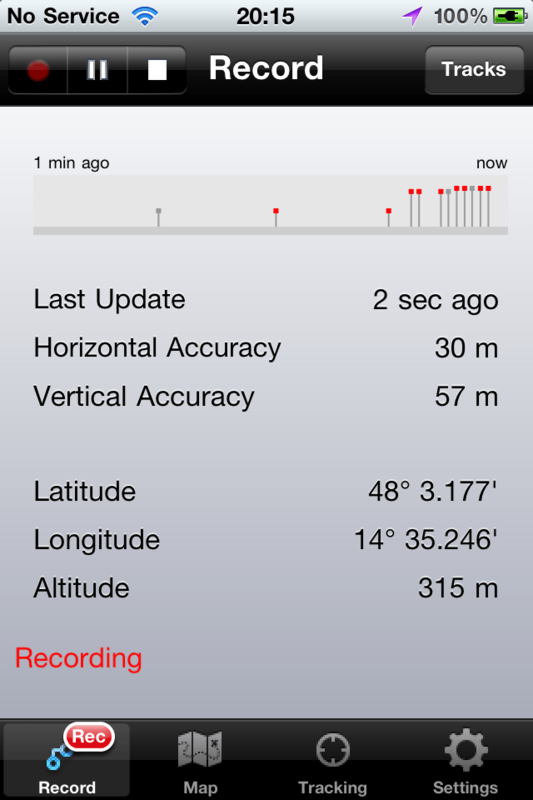 For example I had considered adding Google Latitude updating as a Tracking choice. But 1.1.0 is meant to give my customer (and other people with similar logistics use cases) a tool which he can easily install through the app store. The problem with those many ideas is that nobody is paying for their implementation. On both the full and the free version (ads) I’m making like 10 Dollars a week. Only if I see a dramatic uptake in downloads I will be able to afford implementing more features. But I’m still interested to hear your thoughts should you be amongst those few people who have a use for this uncomplicated app. Maybe it helps a bit that I am also targeting iOS 3.x which still is the OS of choice for iPhone 3G. Where I previously had only AdMob ads, I have now also iAds on iOS 4 devices with AdMob being the fallback. I’ll report on how that goes. I just submitted the app to Apple for approval. I tested orders of magnitude more than before and eliminated all bugs that I could find to make this a really high quality release. So I added it. Much obliged! Update: I found two bugs in the free version for which I just submitted update 1.1.1: Ads could not be tapped on and I had forgotten to include background location support. I fully understand that you can’t get too deep into supporting a 99 cent application. Yet I’d like to make some comments. Note that I am using a 1st generation iphone. 1. Although I am quite technical (Prof. of Computer Science etc), because this field is unknown to me, I find many settings incomprehensible: (1) Desired Accuracy vs. Distance Filter, (2) Filter Stand Still, (3) Filter Signal Dips, (4) Linked Services (5) Location Updates, (6) Configure Tracking Services. I believe you should write a small document with simple explanations. This is what Apple/iPhone are all about! 2. The meaning of the bar graph is not clear. Sometimes there is a red tip to a bar, sometimes not. I set the frequency to 1 minute but sometimes the bars are 10 seconds apart? Does each bar represent an update or simply a signal detection? thank you for your comments. Did you not find the bundled instructions sufficient to explain the settings?